Answer these fun questions and win big! Q 1: What did you do to fuel your love at home last saturday? Q 2: Fragrance plays an important role in setting the right mood. Which fragrance fuels your love life? Note: Limited period offer. Gifts will be dispatched on a first come first serve basis. Terms and conditions apply. Gels by Odonil increases fragrance in your room and turns on the romance in your life, with 4 unique fragrances - Lavender, Jasmine, Lemon & Rose. 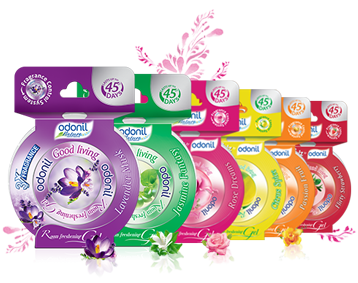 Check out Odonil bathroom air freshener . With unique fragrance control mechanism.